As we know android is ruling the world of IT nowadays. First no one ever imagine to work with these smart phones. But now everyone has a huge source of information in their hands, which is called mobile phone. This is the most amazing feature, that you can control your PC with your mobile and use as a remote control. I also use this feature on nokia phone and feel great. Honestly speaking, I'm Symbian user not android. My grandfather gives me nokia as a gift, so now I'm using for him. So lets come straight to the point. You can use this feature with Bluetooth and WiFi. Why I should use and spoil my memory? 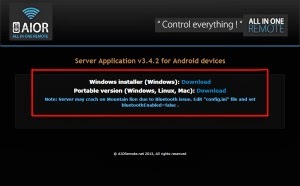 You control your PC directly to your mobile. Sounds great. Let's suppose you attach your laptop with LCD/led and you are watching a movie, so you need to change voice, time, speed you can handle with your mobile. No need to go there and change things.. You surely will see its advantage. Lets see how to use and install it. First check if you have Bluetooth available on your laptop/PC.in my case I have Bluetooth on my laptop which is not working. But don't worry if you don't have you can use wifi though. Just follow these steps below. After installing this app. You have to install the server on your computer in order to connect your phone with pc.to download the server just click this link. Skip the ad and see the file. You can see different options for server choose what you need. I mean, if you use window, choose the windows downloading option. No rocket science. Open the file from the location where you placed it. Double click the file and another window will appear which will look like this. Under general tab you will see the IP addresses ( which is the address of your internet) and if you are using Bluetooth you will see a Bluetooth server address. After this open installed apps from your Android phone and you will see different options like gamepad, mouse etc. As you can see in the picture below. First you will not able to use any of this as you are not connected. Connect your mobile first. Press the + button which is on the top right corner and enter the title for your connection and then select connection type Bluetooth/wifi. Make sure if didn't close the server on your pc.if you are using Bluetooth it will show Bluetooth area and vice verse. 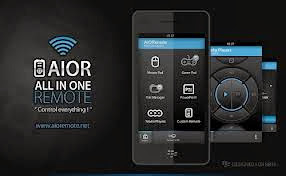 If you want to use with Bluetooth, select the Bluetooth option and All you do is to see your Bluetooth address from a server software from your PC and enter the address in your AIO app and connect it. If you want to use WiFi connection. Tap on the search and all you do is to see IP address fro your server and put the address in AIO app it will automatically connect you with your PC. And then click ok.